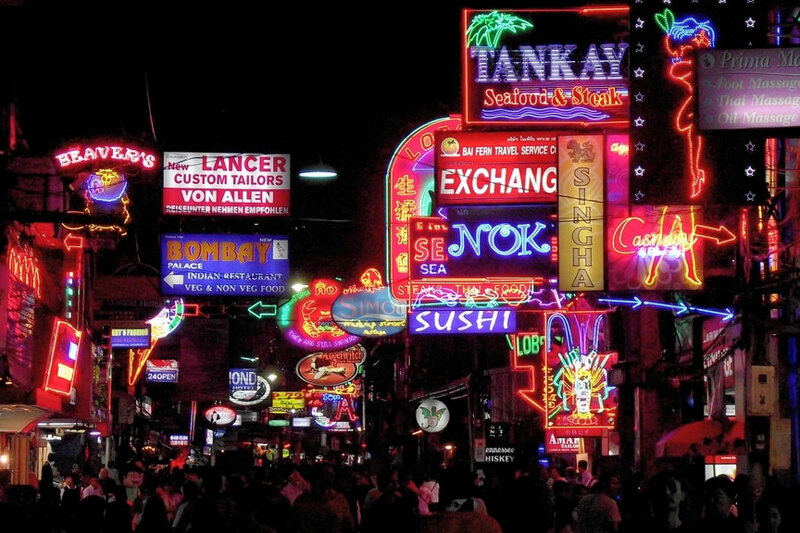 Located on the east coast of the Gulf of Thailand and just over 100 kilometres away from the capital, Bangkok, Pattaya is one of the most popular cities in Thailand. People travel to Pattaya due to its proximity to the stunning Thailand coastline, with glorious sandy beaches and clear blue sea for everyone to enjoy. Whether you are a water sports lover or someone who prefers to spend their free time sunbathing on the beach, you will find it all on the coast of Pattaya. There a lively nightlife, with plenty of restaurants and bars to choose from, many of which stay open into the early hours of the morning. Therefore, if you have been out playing golf all day, you do not have to worry about the time you return to Pattaya, as everything will be open and you will have the pick of the restaurants for a lovely evening meal. Take a stroll down Walking Street, which comes alive at night with food vendors and live street entertainment. If you are looking for something a little more relaxing following a round of golf in Pattaya, why not book a seat at the Tiffany Cabaret Show at the Grand Theatre? There are so many choices in terms of food and entertainment in Pattaya, one thing you will never be is short of something to do and the same can be said when playing golf in the region. There is a great choice of budget golf courses in Pattaya, making it the perfect place for a golf holiday in Thailand. However, before you go ahead and book a tee time at one of the budget golf courses in Pattaya, you should take a note of the climate and the best times to play golf throughout the year. The weather is hot all year in Pattaya but there are three distinct seasons to look out for, when booking a golf holiday. Between the months of June and October you should expect to see rain and when it comes it does so with a vengeance. That being said, because the rain tends to come in heavy downpours, there are not many days when it is wet all day and this means you can still find time to book a round at a budget golf courses in Pattaya. From March to May you will find the hottest weather, with temperatures reaching 35 degrees. There will be times when it feels humid and this can make playing golf difficult but thanks to Pattaya’s location on the coast, sea breezes help to keep things more manageable and brief bouts of rainfall help to clear the air. However, if you want to get the most out of your time on the budget golf courses in Pattaya, the perfect months to book are November through to February. This is known as the cool season in Pattaya but do not be fooled into thinking you will need to pack your knitwear to enjoy a round of golf, far from it. Temperatures tend to fall between the mid to late 20’s and there is very little rain to worry about, making it the perfect time to visit for a golf holiday. One thing to keep in mind, is during the cool season, many people visit Pattaya due to the perfect weather and this can see hotel prices and green fees at their most expensive, so if you are looking for a budget golf holiday in Pattaya, a good tip is to look at the shoulder season, perhaps at the start of November and the end of February. With that in mind, let’s look at the great selection of budget golf courses in Pattaya and see which ones work their way to the top of your list. This was one of the first golf courses in Pattaya and was established in 1958. Designed by the Japan Golf Promotion Company, the golf club is situated just 40 minutes from Pattaya city centre and can easily be reached via taxi. Bangpra is known for being one of the best value and great budget golf courses in Pattaya, due to its competitive prices and top quality golf course. 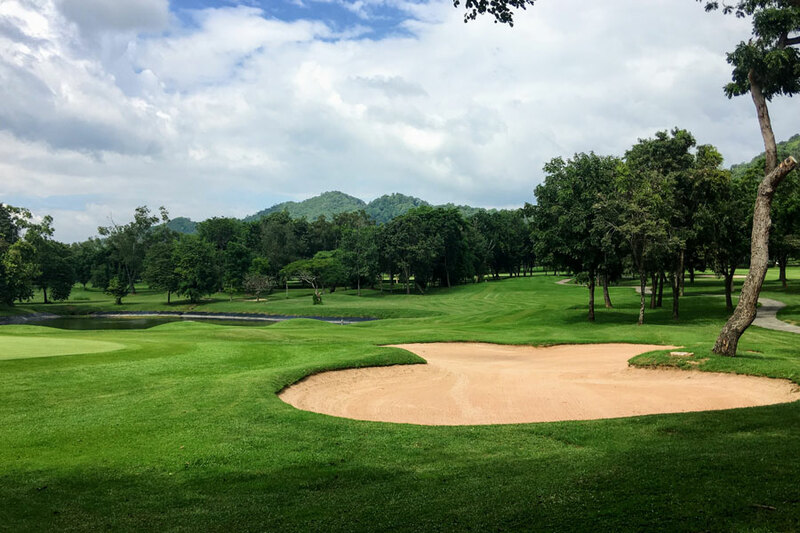 The golf course and facilities were updated in 1988 but Bangpra has kept much of its original features, making it one of the most mature golf courses in this region of Thailand. There are trees of many varieties throughout the course and the fairways are gently undulating, with wooded forests surrounding the outside areas of the golf club. The front nine is often regarded by visitors as being the best, with water hazards and superb bunkering, which test players of all abilities. The back nine is noticeably flatter than the front nine but with two island holes, featuring shots over water from tee to green, you cannot afford to lose concentration and good club selection becomes crucial to make a low score. Having completed the 18 holes, why not head into the luxurious clubhouse for some refreshment? There is a great choice of Japanese cuisine in the restaurant and it’s a great way to finish a round of golf at Bangpra Golf Club, one of the top budget golf courses in Pattaya. Located just a few kilometres further outside the city than Bangpra Golf Club, Emerald Golf Club boasts an 18-hole championship golf course, designed by Nick Faldo and Desmond Muirhead. The course opened in 1995 but has since enjoyed a rebranding in 2006 and this has restored the course to its very best. 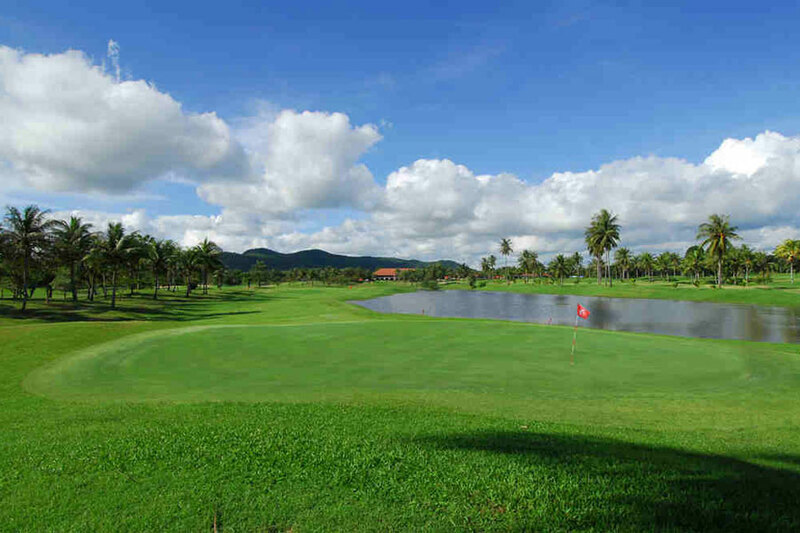 Emerald Golf Club features high on the list of budget golf courses in Pattaya due to its low prices yet high quality golf course and facilities. 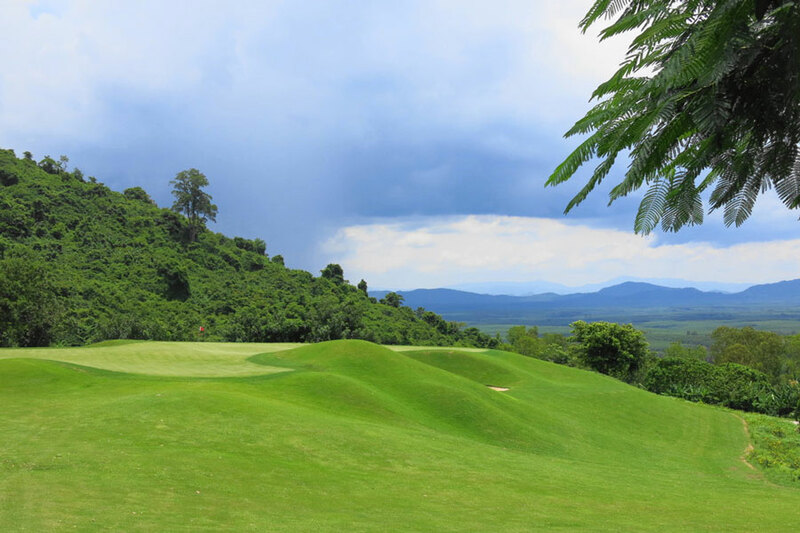 The course is spread out amongst a jungle, with meandering hillsides and some of the best holes in this region of Thailand. Water hazards do not play as big a role here as they do at many other budget golf courses in Pattaya but the narrow, undulating fairways and strategically placed bunkers, make for a challenging round of golf. Accuracy off the tee is crucial for a low score at Emerald Golf Club and distance is a secondary issue, with rough, trees and bunkers waiting to gobble up anything which is wayward off the tee. The clubhouse is small but has a nice open-air restaurant where you can enjoy some food and drink while discussing your round. Emerald Golf Club is not as famous as many of the other golf courses in Thailand but this is what makes it a top choice when it comes to selecting budget golf courses in Pattaya. Just over an hour away from the city centre, you will find another fantastic budget golf course in Pattaya, Greenwood Golf and Resort. 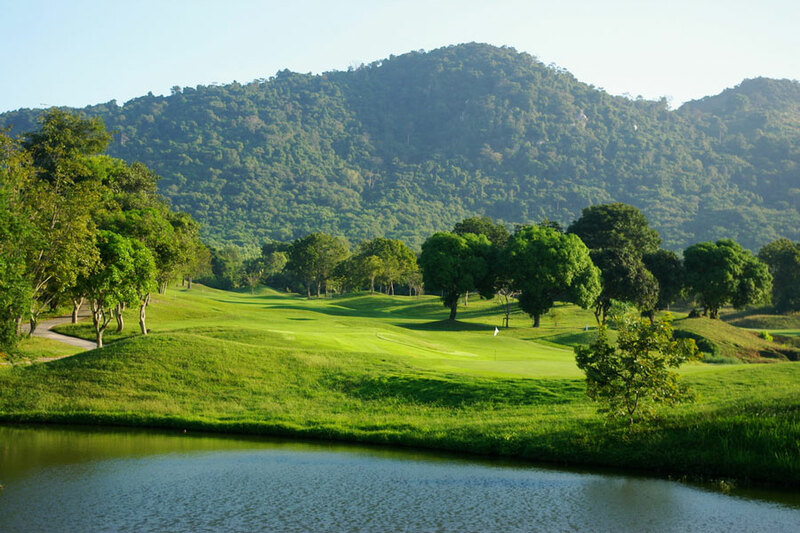 Designed by Peter Thompson and open for play in 1993, this golf course is situated among the tree-clad hills of Chonburi, which makes for a lovely view when playing 18 holes of golf. This is a golf course which has the designers name written all over it, with strategic thinking key to a good score. Greenwood Golf and Resort has a distinctive British feel to it, with several pot bunkers and testing rough from which to escape. There are also well placed sand traps to avoid but water is not a huge feature, so for those who get nervous when playing around the drink, this could be the pick of the budget golf courses in Pattaya for you. There are three lots of nine holes, making 27 holes in total and although the course is best described as being in a parkland setting, the numerous fairway undulations give the feel of being on a links style course. Precise driving and good club selection are key to achieving a low score at Greenwood Golf and Resort, with the rough and pot bunkers waiting to collect anything which is less than accurate. Having finished your round of golf, head to the clubhouse where you can enjoy a cool beer on the balcony and watch other golfers play the course and see the sun set over the Chonburi countryside. It’s the perfect way to finish a round of golf at a club which should be high on your list of budget golf courses in Pattaya. This golf course is a little further out from Pattaya city centre than the other budget golf courses in Pattaya listed in this article but with two 18 hole courses to choose from, it is well worth the hour journey. Designed by Prasobchai Kasemsant and established in 2002, not only is Wangjuntr Golf and Nature Park one of Pattaya’s best budget golf courses, it is one of the most spectacular, perhaps in the whole of Thailand. So, if you were having second thoughts of making the trip from Pattaya city centre to play this course, think again. Each of the course layouts feature 18 fairways and 36 greens, which for those who have played golf in Japan will be nothing new, as this is a common element of golf courses in that country. 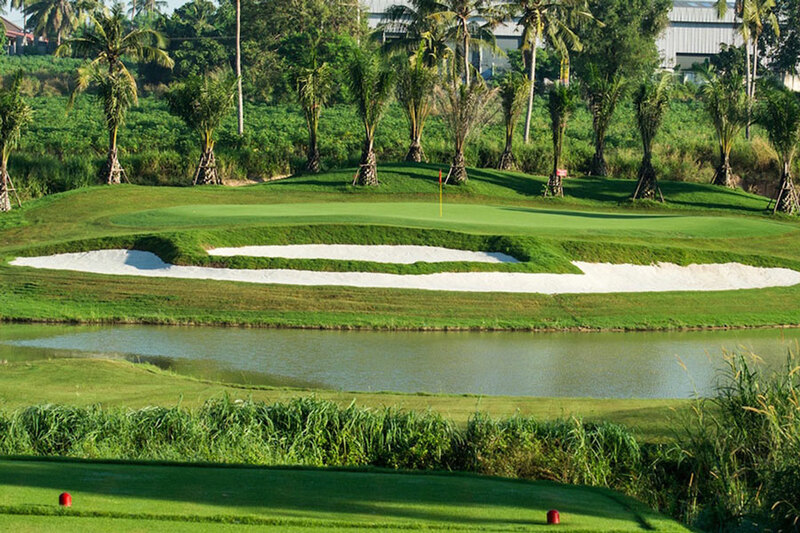 The intention was to make this an environmentally friendly Pattaya golf course and the original landscape of pineapple and sugarcane plantations have been reconfigured and implemented into the two golf courses. With the large natural trees in the area preserved, both courses give the feel of being out in the natural wilderness, which is very exciting. 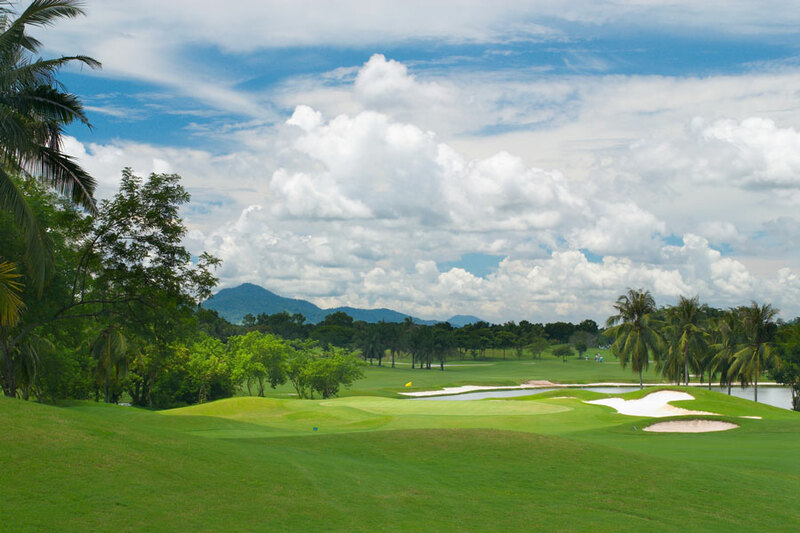 Both courses play quite long, with the Valley Course over 7,100 yards and the Highland Course over 7,600 yards, making the latter one of the longest golf courses in Thailand. Both courses provide a good test for golfers of all abilities but the Highland Course is the tougher of the two, so if you do not want to throw yourself in at the deep end, you could start with the Valley Course in the morning and head to the Highland Course in the afternoon, making for a fantastic and challenging day of golf. The best hole on the course is arguably the 11th hole of the Valley Course, which is a par-5 measuring almost 700 yards. You want to make sure you have packed your driver when playing at Wangjuntr Golf and Nature Park, which is a golf club that must be seen to be believed. Don’t just take our word for it, book yourself a round at what is not only one of the great budget golf courses in Pattaya but one of the most intriguing in the whole of Thailand. One of only five golf courses in Thailand designed by Robert Trent Jones, Eastern Star Country Club and Resort remains one of the best value budget golf courses in Pattaya. It’s a little closer to the city than some of the other golf courses mentioned above and due to its location close to the coast, feels much cooler. Therefore, if you are planning on coming to Pattaya for a golf holiday during the hottest months of the year, Eastern Star Country Club and Resort would be the perfect choice for a round of golf. As you may have guessed due to its proximity to the coast, this golf course has a strong links style feel to it and works its way through the residential resort, with many undulations on both the fairways and the greens. The course has played host to several regional tournaments and comes complete with 65 bunkers and 11 lakes, so beware of the hazards when planning your shots. You must have a clear strategy in mind and good club selection when playing Eastern Star Country Club and Resort because the rough is very deep in places and can be difficult from which to escape. Thankfully, most of the fairways are quite wide and open and this makes the course suitable for both beginners and advanced players. There is a lovely restaurant serving a range of Thai and international cuisine and if you opt to stay at the resort, you can make use of the Olympic sized swimming pool and tennis courts. However, for those who just want to enjoy a round of golf, Eastern Star Country Club and Resort remains one of the leading budget golf courses in Pattaya. In addition to the tremendous selection of budget golf courses in Pattaya we have listed above, there are others we also recommend you try. Mountain Shadow Golf Club features a delightful course designed by Ronald Fream and Pattavia Century Golf Club is a golf course set in lovely rolling countryside, both of which are very affordable. Parichat International Golf Links is close to the city centre and provides one of the most challenging rounds of golf in the area, with water coming into play on a regular basis. The locals rank this as being the most difficult course in Pattaya, so if you want to challenge yourself, without breaking the bank, we recommend you book a round at Parichat International Golf Links. 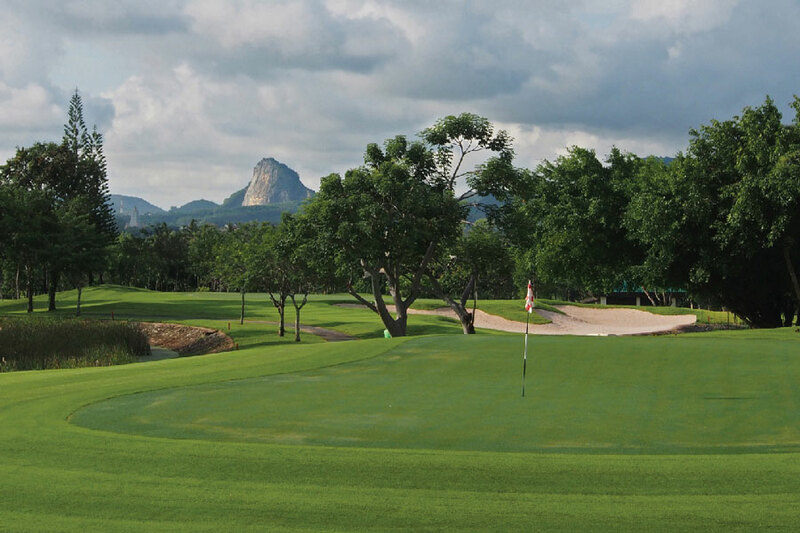 For a more relaxing round of golf but one which is great value, head to Silky Oak Country Club, which is located 40 minutes away from the centre of Pattaya. This course is named after the tree which is prevalent in the area and despite having 18 holes, features only nine fairways. Therefore, the fairways are shared and this makes them very wide to accommodate golfers playing in both directions. The greens are also large and although you will be tempted to reach for the driver at every opportunity, you must pay attention to the undulating fairways and always keep your ball under control, to achieve a low score. Make sure you stop at the half-way house, where you can enjoy stunning views over the golf course and to the hills and mountains in the distance. With so many excellent budget golf courses to choose from in Pattaya, the only question you need to ask yourself is how you are going to fit them all in? By using the city of Pattaya as a base, you will have the opportunity to play as many of the golf courses as time will allow, while enjoying the local food and surroundings. So, which budget Pattaya golf course are you going to play first?